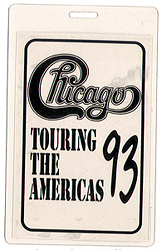 Description: 1993 Chicago World Tour Crew Laminate. Official Tour laminate owned and used by sound engineer David "Cowboy" Conyers. Item is VG+ condition. Limited item. 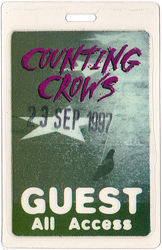 Description: 1997 Counting Crows Guest All Access laminate stagehand Pass. Official show laminate issued for the September 23, 1997 concert at the Shoreline Amphitheater in Mountain View, CA. 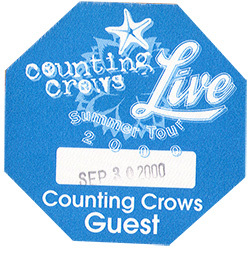 Description: Counting Crows / Live - 2000 Guest Backstage Pass. Item in VG+ conditon. 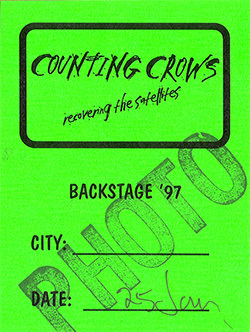 Description: Counting Crows - 1997 Recovering The Satellites Photo Pass. Item in VG+ condition.